World Lemur Day is celebrated each year on the last Friday of October. Lemurs are emblematic species in Madagascar and unfortunately, these little primates face considerable threats. IUCN indicate that 105 species and subspecies of lemurs are under threat on 111 that we know with 95 % of their population on edge of extinction. 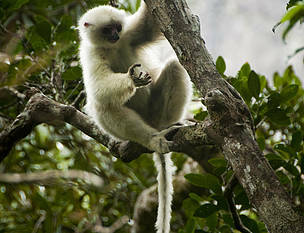 To mark the event, SAVA region in The Northern Highland of Madagascar organize his lemur festival. “Fetin’Ankomba” (lemur celebration) will be celebrated in Andapa for the day of October, 31 in partnership with Wildlife Conservation Society, Duke Lemur Center, Madagascar National Parks et Lemur Conservation Foundation. A large carnival will cross the city of Andapa with the participation of about twenty associations and organizations of the Civil Society, as well. Committed to their protection, WWF is working with nine community based organizations in the rainforests of Marojejy - Anjanaharibe Sud - Tsaratanana Forest Corridor (COMATSA) for the preservation of their natural habitat. Because the conservation of lemurs cannot be done without the protection of forests through patrols, ecological restoration, environmental education for villagers. "The Silky Sifaka or Simpona, ranked among the 25 most endangered species in the world, is the emblematic lemur of the Northern Highlands. We are working on the protection and restoration of approximately 25,000 hectares of forest in Southern COMATSA to build a forest corridor for these magnificent primates, between Marojejy National Park and Anjanaharibe Sud Special Reserve "says Fenohery Rakotondrasoa, Landscape Manager in the Northern Highlands. Join us for this celebration and follow us on social networks. Support the conservation of our friends the lemurs!